Brown spots are a common part of aging. Over time, however, they can negatively impact the appearance of one’s skin. At the Center for Dermatology and Laser Surgery, we offer several options for eliminating or diminishing brown spots and keeping skin looking youthful and clear. 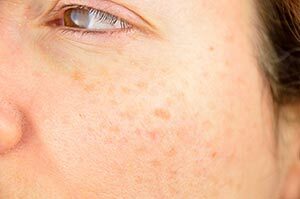 The development of brown spots can depend on several factors, including daily exposure to ultraviolet radiation (UV), injury to the skin, previous sun damage, one’s skin type and genetics. Brown spots usually start to appear in the late 20s, but depending on the patient, they can show up earlier or later on in life. Brown spots are also known as age or liver spots, and they are flat, painless areas that are light brown to black in color. They vary in size, but are larger than freckles and tend to appear on the parts of the body that are most often exposed to the sun, such as the face, hands, arms and shoulders. What are effective treatments for brown spot? We offer numerous effective treatments for reducing the appearance of skin discoloration and promoting a more uniform complexion. These treatments include laser both resurfacing and non-resurfacing, chemical peels as well as bleaching. Other procedures that are performed at the Center for Dermatology and Laser Surgery for the treatment of brown spots include liquid nitrogen and microdermabrasion. After the patient’s provider has diagnosed the patient with brown spots following an examination of the skin area in question, they can together determine the best course of treatment. Because brown spots are not medically dangerous, removing them is a cosmetic procedure with the main goal of creating aesthetically pleasing results. Deciding which procedure will be best suited for addressing brown spots and attaining the patient’s desired results depends on each person’s unique skin condition and concerns. It’s never too late to get rid of unsightly brown spots and attain clear, blemish-free skin. Those beginning to see the first signs of brown spots can also consult with our cosmetic providers regarding skincare treatments and regimens that can preemptively prevent the development of more brown spots. If you are interested in learning more about the Center for Dermatology and Laser Surgery’s various treatments for brown spots call the cosmetic team providers at 503-297-3440 for a complimentary consultation.